According to the Bureau of Prison Rules and Regulations, granting furlough is the legal rights of a prisoner. However, the authorities continue to deny many of the political prisoners the furlough that they are entitled to according to law. 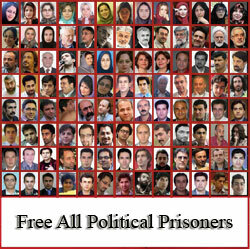 Currently there are number of political prisoners in various prisons in Iran that have been denied furlough despite being in prison for long periods of time. This issue becomes more important and relevant for the female political prisoners, because many of them have small children and lengthy absences from their families and their children could inflict irreversible damage to them. Currently there are number of female political prisoners in Evin prison who have children under the age of 18 but have not been granted furlough since being incarcerated. Attorney and women and children’s rights activist Nasrin Sotoudeh was arrested on September 4, 2010. She was placed in solitary confinement for four months. She was tried in Branch 16 of the Revolutionary Court and was sentenced to 11 years in prison and banned from practicing law for 20 years. Nasrin Sotoudeh was incarcerated in the high security ward of Evin 209 for about eight months before being moved to general ward 350 in Evin. Banned from education, Atefeh Nabavi was arrested along with her cousin Ziaeldin Nabavi and six of their other friends on On June 15, 2009. After five months of incarceration in a limbo status, Atefeh was put on trial in Branch 12 of the Revolutionary Court. She was convicted and sentenced to four years in prison on charges of conspiracy to act against the national security by participating in the anti government mass protest on June 15, 2009. Atefeh’s sentence was overturned by the Appeals Court and was reduced to 3 years in prison. She has been in prison for two years without being granted furlough. Farah Vazehan was arrested on December 29, 2009 by the Army’s Intelligence agents. She was tried in Brach 15 of the Revolutionary Court and was sentenced to death on charges of Moharebeh (enemy of God). Her sentence was later overturned by the Supreme Court and case was sent to Branch 28 of the Revolutionary Court. Vazehan was sentenced to 15 years in prison by Branch 28 of the Revolutionary Court on charges of Moharebeh and insulting the Supreme Leader. She was exiled to Rejaei Shahr prison as part of her sentence (a prison in Karaj, Iran where criminals are incarcerated). Despite her poor health and more than a year and a half in prison, she has been denied furlough. Women’s rights activist Alieh Eghdamdoust was arrested in January of 2009 for implementation of the three years prison sentence she had received earlier for participating in a peaceful rally on June 26, 2006.
she has been in prison for more than two years without being granted furlough. Women’s rights activist Kefayat Malek-Mohamade was arrested after the mass protest on Ashura (December 2009). At age 65, she is the oldest female political prisoner with various health problems but to date the officials have not granted her furlough. Fatemeh Rahnama was arrested on 29 July 2009 by Intelligence Ministry’s agents. At the time She was called by the pro regime sites as the temporary wife (Sigheh, allowed under Sharia Law) of the then incarcerated Shapour Kazemi (Mir Housein Mousavi’s brother in law). Branch 26 of Tehran Revolutionary Court sentenced her to ten years in prison in exile on the charge of “relations with Mujahedin-e Khalgh Organization” (MEK). Her sentence was upheld by the Appeals Court. Despite suffering from depression and various health problems, she has not been granted furlough in the two years that she has been incarcerated. She is one of the few female political prisoners that has been exiled to a prison outside of the city of her residence. She is currently serving time in Ahva’s Sepidar prison. Rayhaneh was arrested along with three of her family members during the Ashura protest events (December 2009). Rayhaneh was among number of other defendants that gave a televised false confession. She was originally sentenced to death by lower court. Her sentenced was overturned by the Appeals Court and was changed to 15 years in prison. She has been in prison for over a year and a half without being granted furlough. Motahareh was arrested in connection with Ashura protest events in 2009 along with her husband during a raid of her home. She was initially sentenced to death but the Appeals Court overturned her sentence giving her 15 years in prison. Despite her multitude of health problems and her age she has not been granted furlough since her arrest. Fatemeh was arrested March of 2010 along with her daughter. In July on 2010 she was tried in Branch 15 of the Revolutionary Court and was sentenced to 5 years in prison. 55 years old Fatemeh has been in prison since her arrest without being granted furlough. She was the sole income earner in her family which includes a disabled child. Susan Tabiyanian of Bahai faith was tried in the Revolutionary Court in July of 2010 and was sentenced to one and a half years in prison for being of Bahai faith and for promoting her faith. She has been incarcerated in Evin prison since her arrest and has not been granted furlough. Maryam was arrested during the Ashura protests of December 2009. She has three children with the youngest being three years old. She was kept in the high security ward 209 of Evin prison for 3 months before being transferred to the general ward 350 in Evin. She was sentenced to 15 years in prison by lower court and her sentence was upheld by the Appeals Court. Despite having 3 children, Mayam has not been granted furlough since her arrest. Student activist and member of the student’s Islamic Association of the Teachers Training university was arrested on February 19, 2009. She was incarcerated in solitary confinement for three months and was in the high security Evin ward 209 for seven months before being transferred to the general ward 350 in Evin. This student activist was tried and sentenced to five years in prison and exiled to Rejaei Shahr prison by Branch 28 of the Revolutionary Court. Her sentence was upheld by the Appeals Court. She has been in prison for more than two years without being granted furlough. Mahvash Sabet is one of the seven Bahai leaders who are imprisoned. She was arrested in Mashhad on March 5, 2008. She was incarcerated in solitary confinement for six months. After being confined in a limbo status in the high security ward 209 of Evin prison for two years, she was tried last year and was sentenced to 20 years in prison. Her sentence was upheld by the Appeals Court. She is currently in Rejaei Shahr prison. Mahvash has been incarcerated for over three years without being granted furlough. Fariba Kamalabadi one the seven Bahai leaders incarcerated was arrested March 2009. She was incarcerated in solitary confinement for six months and all together was in the high security ward 209 of Evin prison in a limbo status for two years. Last year Fariba was tried and convicted and was sentenced to 20 years in prison. Her sentence was upheld by the Appeals Court. She has been in prison for more than three years without being granted furlough. This entry was posted on Monday, August 15th, 2011 at 5:44 pm	and posted in Human Rights. You can follow any responses to this entry through the RSS 2.0 feed.